WHAT IS THE BRITISH STANDARDS INSTITUTE? The British Standards Institute is the Authority responsible for setting manufacturing standards for product safety and quality. These are strict standards that products should reach or surpass, in order to be regarded as both safe and manufactured to a consistently high standard. Companies wanting to display the respected British Standards Institute’s Kite Mark, pay to have their product(s) tested against British and International Standards. When a company is registered with the BSI, its manufacturing processes and products are checked frequently, to ensure that the high standards set by the BSI are maintained. WHAT IS THE BRITISH STANDARDS INSTITUTE KITE MARK? Products that have a British Standards Institute (BSI) Kite Mark stamped on them, have been checked for safety and quality of manufacture, by the BSI. The Institute carries out strict tests, that have been designed to ensure that the product is safe and has been manufactured to a high standard. The BSI Kite Mark is respected throughout the world. If a product being tested meet British Standards, the manufacturer is issued with a licence, allowing the use of the Kite Mark. WHAT IS THE CONFORMITE EUROPEAN SYMBOL? The European Community sets minimum standards of safety and manufacturing quality, that apply across all member countries of the EEC. Manufacturers working to this ‘lowest’ limit, can display the CE symbol on their products. Minimum standards have been established, that apply to a vast range of products, ranging from toys to motor vehicle components. Manufacturers must ensure, that their products at least meet these minimum standards or risk having them removed from the shelves of retailers throughout Europe. 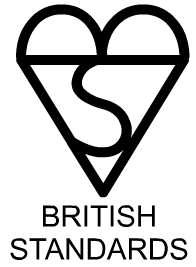 In Britain, companies applying for a British Standards Kite Mark, usually have their products tested against European Standards as well. 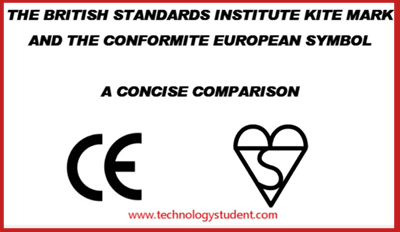 If they are successful, they can display both the BSI Kite Mark and the Conformite European Symbol on their products. HOW DO THE TWO STANDARDS DIFFER? SHORT VIDEO - A CONCISE COMPARISON BETWEEN THE TWO STANDARDS? To achieve the British Standards Institute Kite Mark, high standards of manufacture, safety and quality must be reached and maintained. However, the Conformite European Symbol can be applied to products reaching minimum European standards. The BSI Kite Mark requires products or services to achieve consistently high standards, well above the minimum required by the EEC.